eToro is known as the world's leading social investment network offering cryptocurrency. eToro is a globally recognised online broker offering access to hundreds of financial instruments. The platform emphasises “social trading,” or online user-generated financial content. eToro actively encourages traders to interact with and seek advice from one another through its platform. eToro was founded in 2007, which means the company has been trading for eleven years. eToro is a global trading and investment platform. The award-winning platform connects you with a community of nine million users, with expertise in everything from short-term trading in Bitcoin, to long-term investing in bank stocks. Over the last twelve months, the company has expanded its base to 140 territories and currently employs over 500 people with offices in London, Shanghai, Australia, Cyprus, Tel Aviv and Russia to name a few. eToro is a multi-asset platform which includes FX commodities and ETF's equities. This allows customers to invest in over 1,500 instruments across six different asset classes. During the last twelve months, the company has been expanding its portfolio to include a decent range of cryptocurrencies which eToro has actively been trading as a derivative or CFD since 2015. ▪ Cryptocurrency exchanges allow you to buy and sell real coins. ▪ Most brokers don't allow you to buy Bitcoin directly. Instead they allow you to invest in it via CFD (Contract for Difference), which means you're not buying the coin itself. The exchange buys it on your behalf and you have to pay a daily fee to hold it. Some brokers like eToro are starting to take the middle ground, where you can invest in Bitcoin and not pay the daily holding fee. There are pros and cons to both of these plans. Where pro-exchange arguments will be based around low fees and ownership of the coins. Pro-CFD arguments are for reasons which include better user interfaces, better regulation, and better risk management (e.g. automated leverage). eToro is a cross-over between these two. It allows you to buy Bitcoin directly (not via CFD), but it also has a great user interface for things like opening/closing orders and unique features such as the ability to copy other traders. After pioneering Bitcoin trading in 2013 via CFDs, eToro expanded its cryptocurrency offering. Clients can trade and invest in a total of nine crypto Cryptocurrencies; Bitcoin (BTC), Ethereum (Ethereum), Ripple (XRP), Litecoin (LTC), Dash (DASH), Stellar (XLM), NEO (NEO), Bitcoin Cash (BCH) and Ethereum Classic (ETC). At an event in the UK, Senior Account Manager for eToro Robert Halam, indicated that its most popular cryptocurrencies seem to be Bitcoin, Ethereum, and Ripple. The world has become more aware of cryptocurrencies. 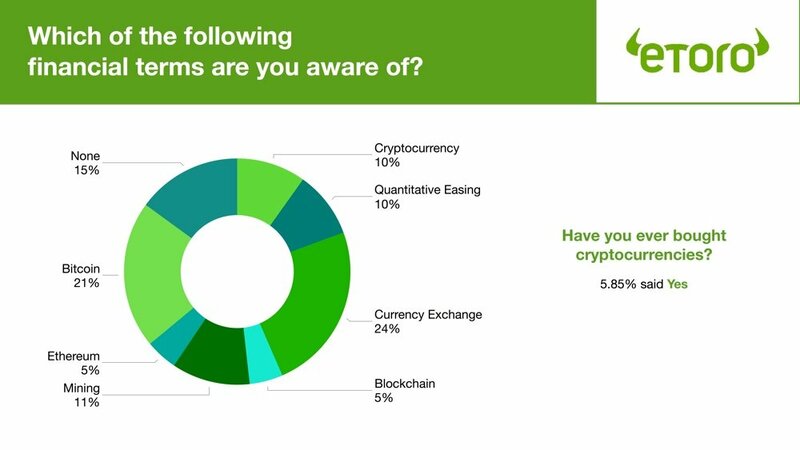 At the end of Q4 2017, eToro conducted its own survey by polling 2000 people from its platform and one of the most significant financial terms asked was: are they aware of Bitcoin? According to the survey, over 42% were aware of Bitcoin, but surprisingly, only 19.4% knew about "quantitative easing." People who responded to the survey, found a strong likeness with their mentality as eToro as an entity, which is very pro-cryptocurrencies. eToro hopes to see further growth in the regulatory sector and wants a general acceptance from governments. 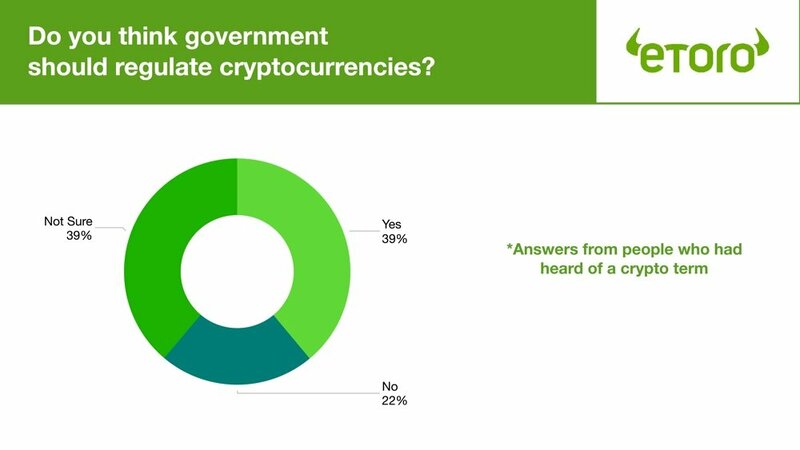 In the survey, eToro asked the question: Do you think governments should regulate cryptocurrencies? An overwhelming number of people actually agreed with this. Among the responses, 38.9% agreed that cryptocurrencies should be regulated, and this reflects eToro beliefs. Out of the 2000 people that were surveyed and even those who had heard of Bitcoin, only 6% had actually taken a plunge and invested in cryptocurrencies. eToro believes that 2017 was the early stage of user adoption into cryptocurrencies. The company does see a growing level of interest from investors. This fact has been derived from internal dialogs with its own account managers, who have had one-to-one discussions with prospective customers. This also includes a growing level of interest from institutional investors too. At the start of last year, people who are interested in cryptocurrencies were between the age of 18-35, single, home sharers who either work in IT or Technology, and had a high interest in cryptocurrencies. 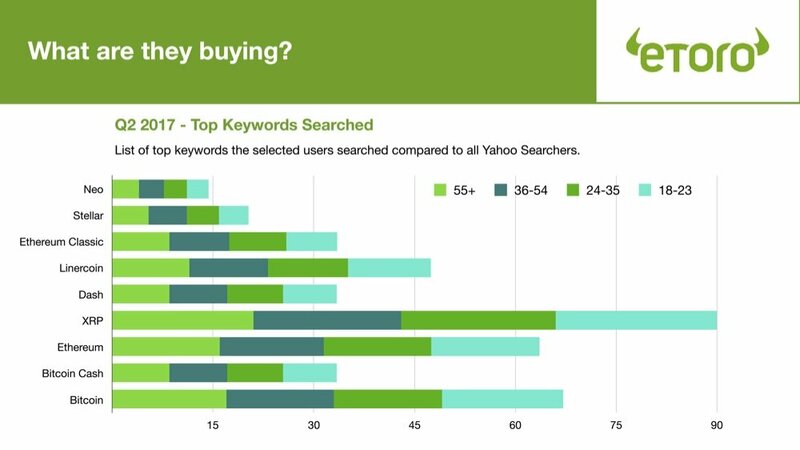 During the second quarter, eToro noticed a slight shift of investors, where the average age increased from 23-37, but generally were of the same class. During the third quarter of 2017, the company noticed a significant change. Typical tech investors between the ages of 30-45 and who were established investors with an appetite for risk, began to engage with the company. By the close of 2017, when Bitcoin was at its highest valuation, mainstream investors who are financially secure, began to invest and the general level of Bitcoin and other major cryptocurrencies was high on the agenda. Looking at the trades and questions posed by the customers on eToro’s platform, the company essentially has a bird’s eye view on what customers are investing in. During the first half of 2017, people were predominately searching and using general keywords on crypto’s such as; Bitcoin and Ethereum. Showing a general curiosity and willingness to tap into the buzz. However, by the end of the year, eToro noticed a significant change in customers behaviours with new keywords being; Bitcoin news, buy Bitcoin, Ethereum price, etc. This matched the general buzz of the market. As Bitcoin peaked at $20,000, investors changed from curiosity to willingness to invest into cryptocurrencies and it has almost broken through to the mainstream. Join me tomorrow as I continue my review on eToro product and services in more detail.